NOTE: an earlier version of this post was disrupted by me tinkering with photos, resulting in their disappearance. I believe all is corrected. Earlier this month I traveled to Alaska’s Inside Passage, the area that covers Alaska and British Columbia is a series of networked passages between various islands along the Pacific coast. 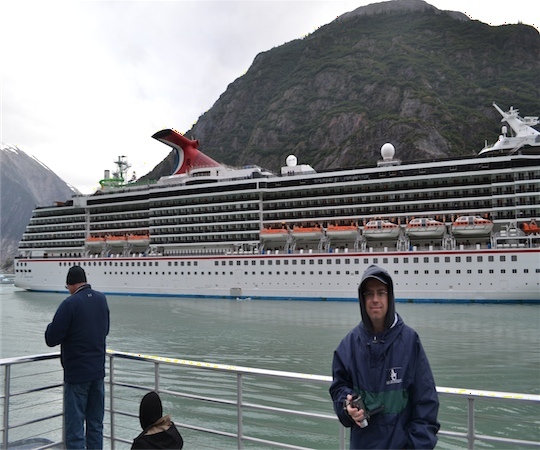 My trip was the standard Carnival Cruise 7 day excursion – Seattle to Tracy Arm Fjord to Skagway to Juneau to Ketchikan to Victoria, B.C.. I may write more later about the ‘cruise ship’ experience but it was about what I thought it would be (enjoyable enough to recommend this particular destination via any cruiseliner). Before leaving on a boat, my group and I spent a few days in Seattle, WA, a city famous for it’s steady rainfall. During my trip, it did not rain, so it is not ‘famous for it’s rain’ for me. 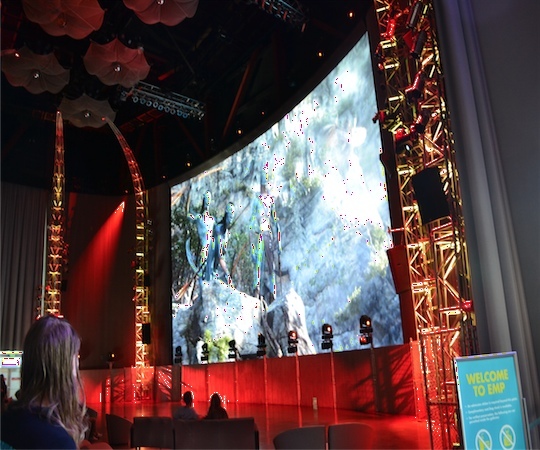 The primary thing I wanted to check out was the Experience Music Project – an interactive music museum with several exhibits, including current rooms featuring Rolling Stones and photographer Jim Marshall, Jimi Hendrix, AC/DC, and of course Nirvana. CLICK ON PHOTO TO ENLARGE IMAGES. 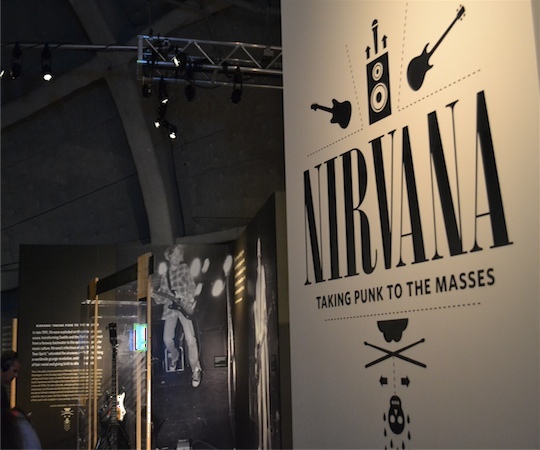 The highlight of the EMP is the Nirvana exhibit, complete with thorough audio tour, memorabilia and essays placing the band and the grunge scene in context within rock music. There were about 3 or four halls of Nirvana displays. 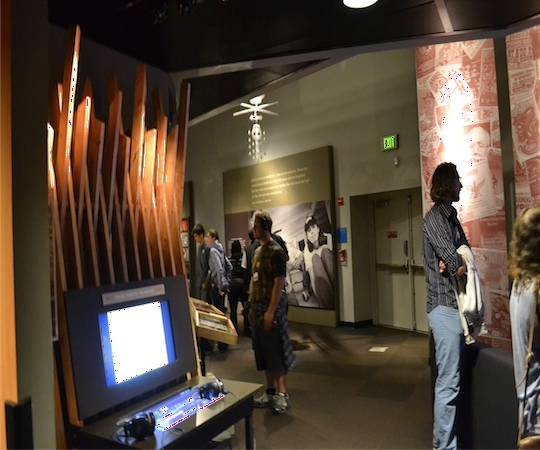 On the uppermost floor of the EMP, there is a music lab, where guests can tinker with guitars, drums, keyboards, audio mixing equipment. 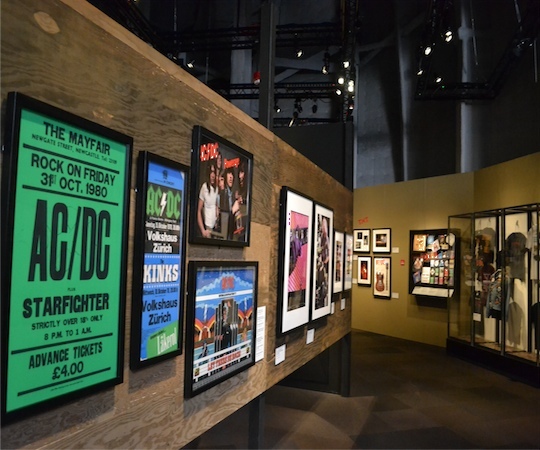 AC/DC was represented with an exhibit. As was Rolling Stones photographer Jim Marshall and rock legend Jimi Hendrix. Each had their own audio tour and related music clips. For $5, the audio tour is the way to go. 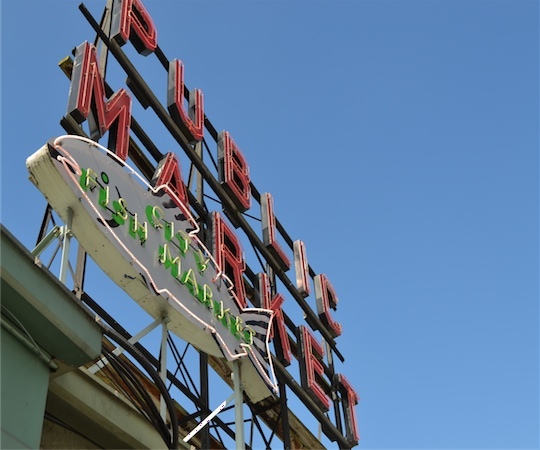 I also visited Pikes Fish Market area (a TON of shops there), the Space Needle, took a short harbor cruise, saw the first ever Starbucks store. 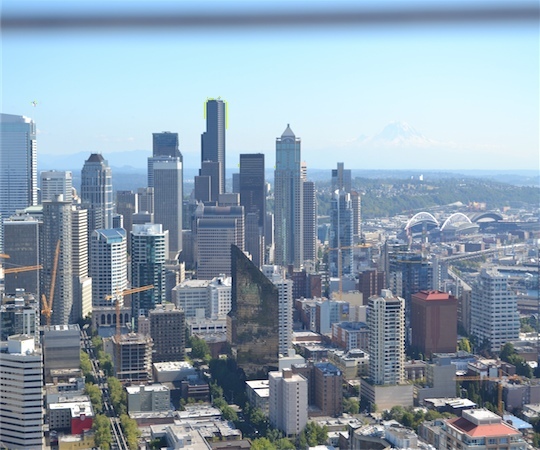 Mt Rainier was also visible on this perfect day and is visible in my photo from atop the Space Needle. 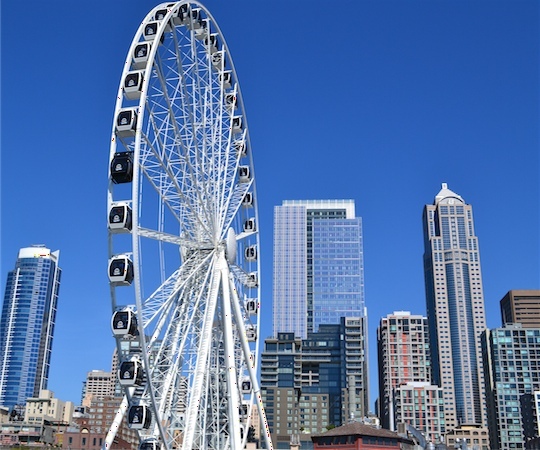 From the short time I was there, Seattle looked like a great city! 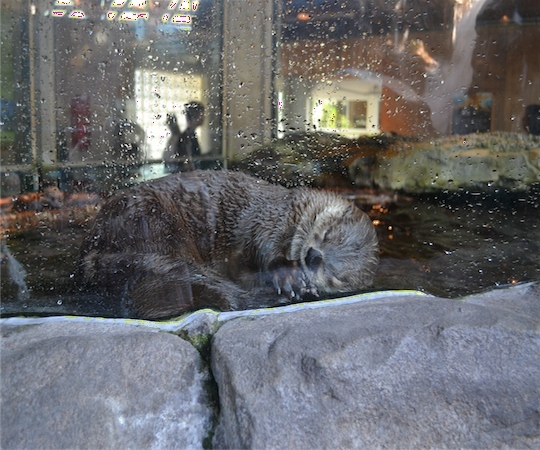 I told this otter to Go The F*ck to Sleep. 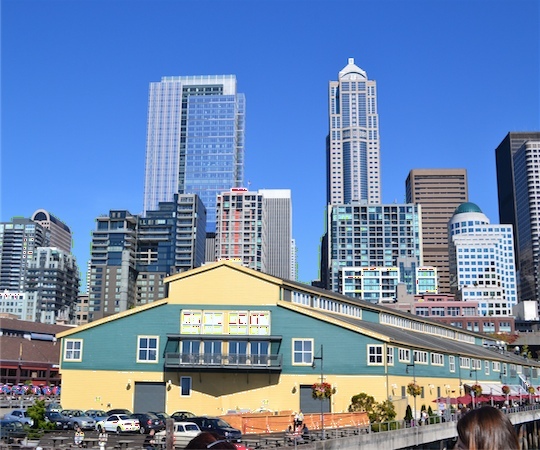 Seattle from the little harbor cruise boat. Who goes to the top of the Space Needle and DOESN’T take a photo? Not me! In the far distance, you can see Mt. Rainier, which isn’t always so easily visible from town. On a Tuesday morning Sept 4th we boarded the Carnival Spirit. This ship is sailing once more (week of Sept 10th) through the Inland Passage and afterward sailing toward Australia where it will run trips there for the remainder of it’s boat-life. 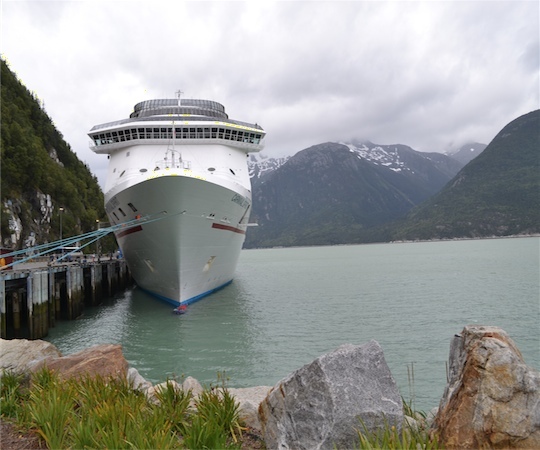 The Carnival Cruise Spirit runs up the Pacific coast, and it’s first stop is in Skagway, AK but one day is spent in the Tracy Arm Fjord, where we get our first glimpse of little tiny baby icebergs and glaciers making their way through the forested mountains down to the ocean. Further inland, the water is still and bright green (glacial silt gives it its color). 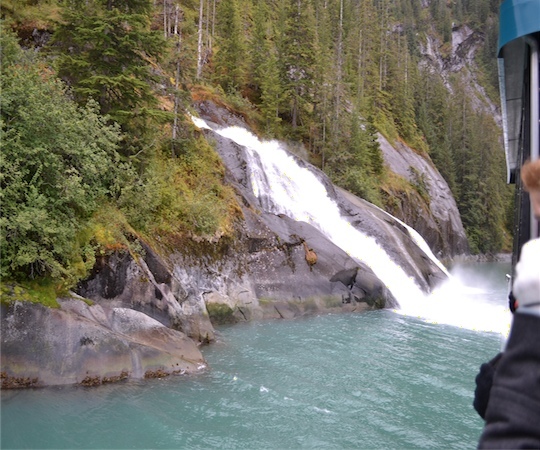 Dozens of glacier water falls dot the steep mountainsides. I saw a few dozen lazy seals near the glaciers, one flying bald eagle. Upon returning to the cruise ship at about 7 pm, we spotted several orcas swimming in small tight circles along the coast. Excursion Nerd Alert! 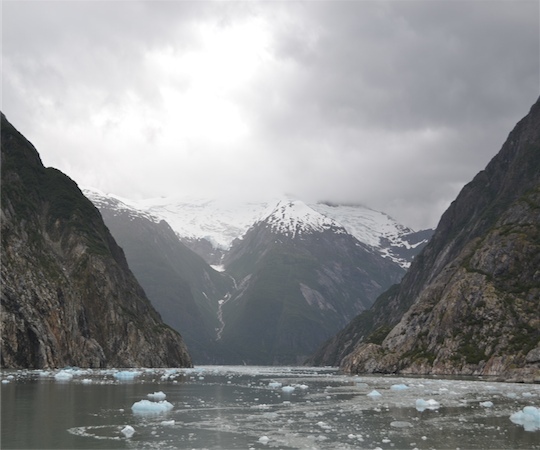 Off the Carnival Spirit and headed further up the Tracy Arm Fjord. 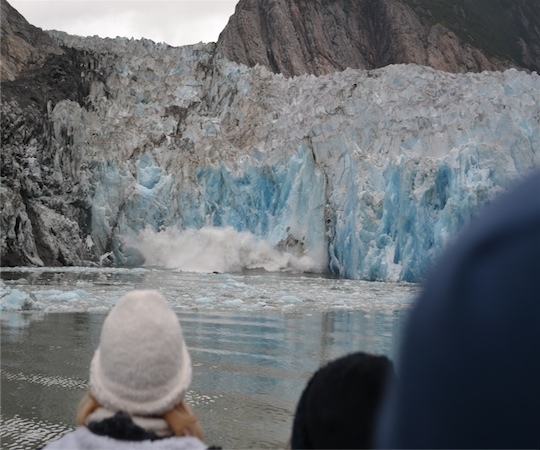 Dozens of glacial ice waterfalls flow down the steep, forested mountains, mixing fresh water into the ocean salt water. 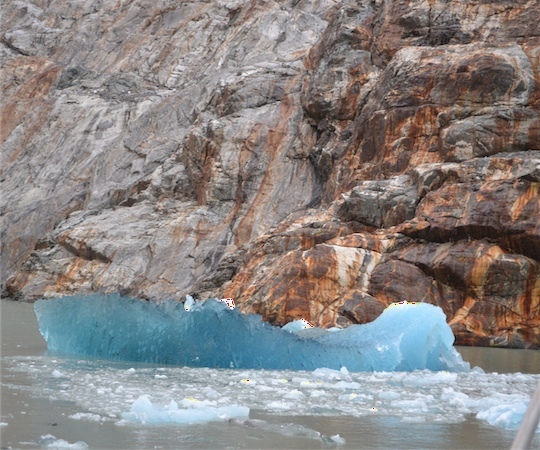 This is the first section we visited – no spectacular glacier calving but some striking blue ice. As we all know, this blue ice is hauled down to the lower 48s to make blueberry Slurpees. 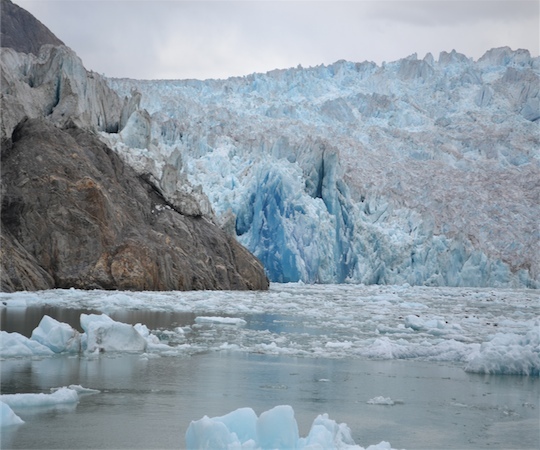 We were fortunate to witness ice calving (or glacier calving), when a sizable chuck fell into the small little glacier bay in front of us. Big splash. The captain of the little boat quickly turned the boat to face the several waves that soon followed. We had some rain during this short tour but it was worth it. Amazing views. 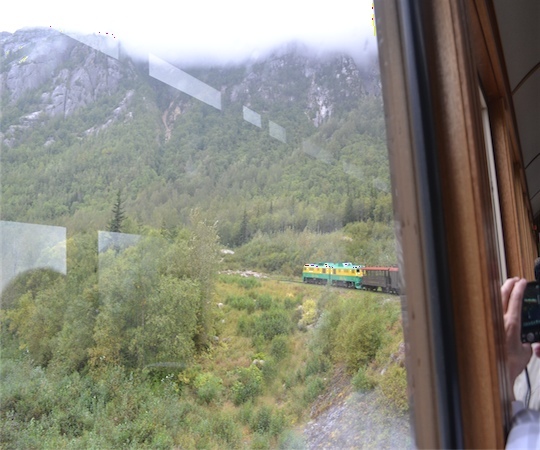 In Skagway, we took a tour that involved a train ride up Mt. Roberts, and a little gold mining demonstration with Two-Ton Tom! 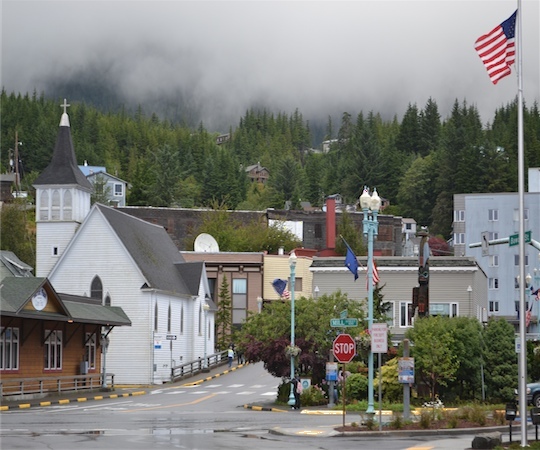 The town of Skagway is about 10 blocks long and relies on tourism now to stay open. Once it was bustling with activity due to the gold rush of the late 1880s. Taken from south end of Skagway looking north. 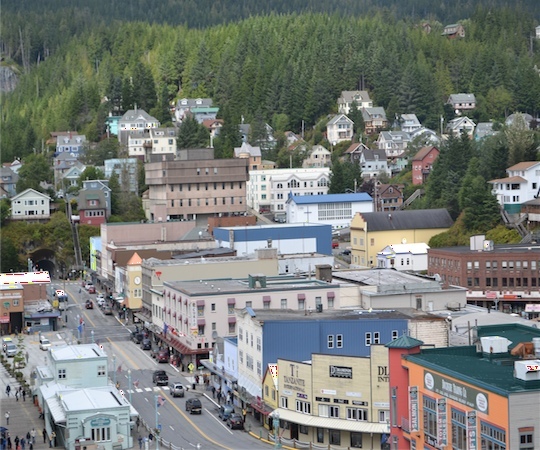 Skagway is about 10 blocks long. The town relies heavily on tourism now but was once part of the gold mining rush of the late 1800s. I was told the town shuts down at end of September and most residents move to warmer territory for the winter. 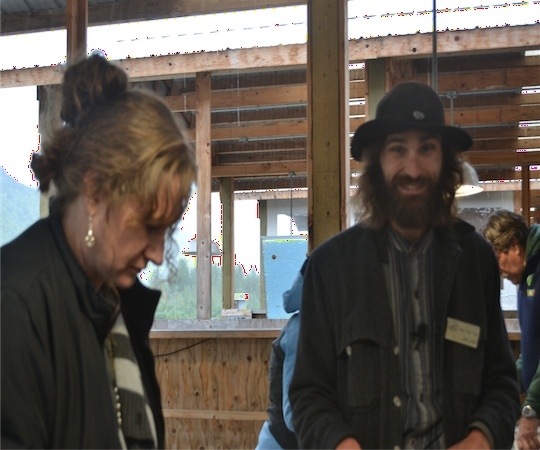 We did the ‘gold mining’ excursion – taking a train up Mt. Roberts to the British Columbia, Canada and Alaska border. Soon after this pic, the clouds showed up and diminished additional chances of photos. But the area was gorgeous. Taken near the top of Mt. 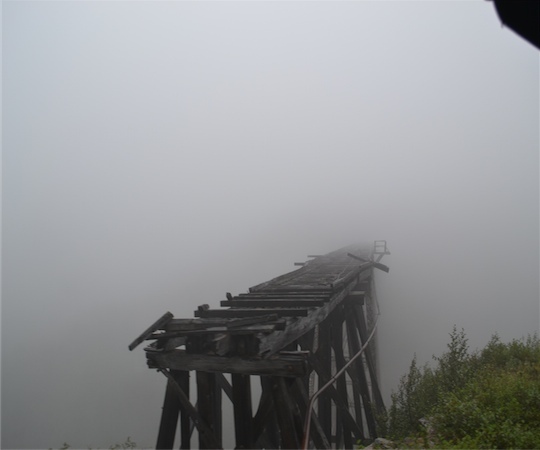 Roberts – an old bridge to nowhere. 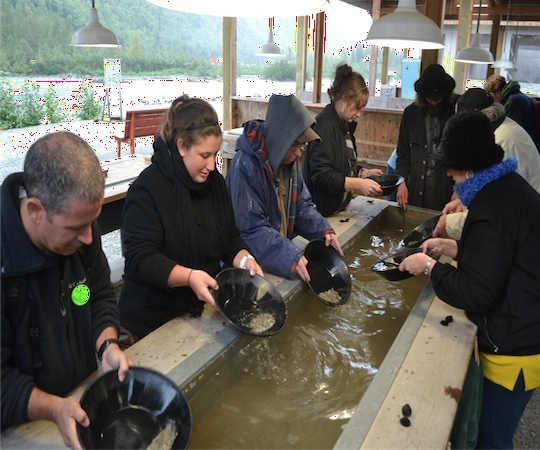 Here’s the crew doing some gold mining, finding a few gold flakes. Can you spot the Carnival Spirit!? 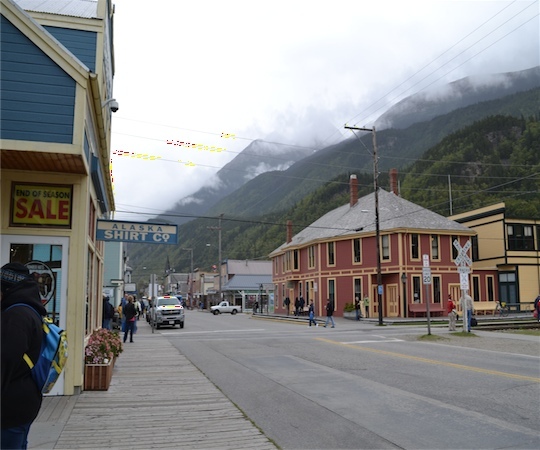 This is our port in Skagway. 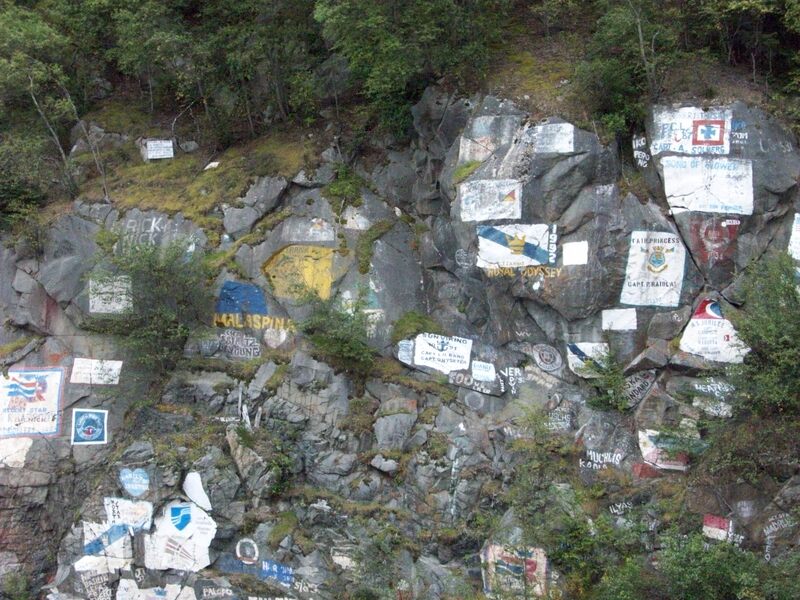 Not pictured is the rock wall/mountain to the ship’s starboard side – here there is a ton of graffiti where crews of ships paint their ship’s flag and record their captains name to honor him. It is said that the higher the crews place this graffiti, the more respect they have for the captain. Tag the wall to represent your ship and captain! 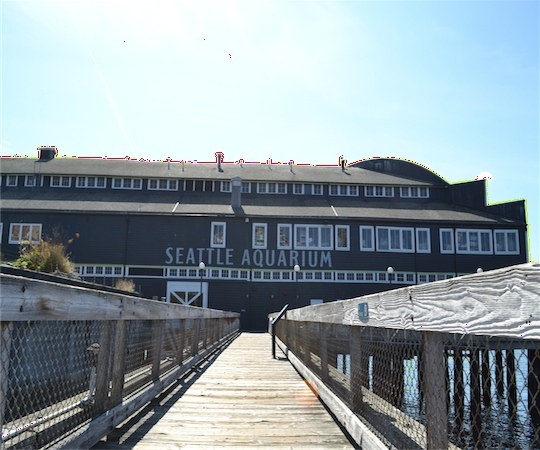 I did not go on any excursions, but did walk through a bit of downtown – like the other ports, there was some interesting buildings. Again, not too much time was allowed to explore but I did have time for the tram ride. 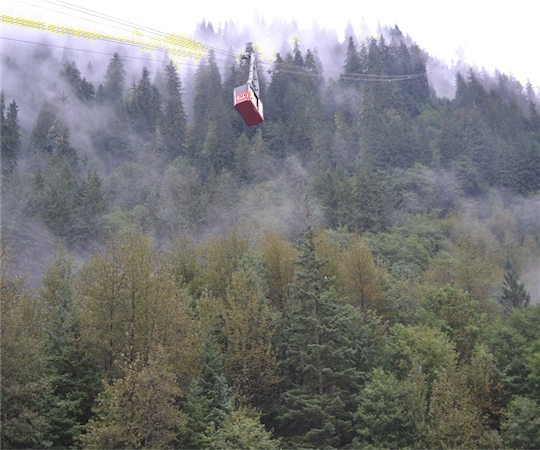 Before hopping on, I took this pic – about half-way between the red tram car and the lower right corner, there is a bald eagle sitting on a tree. 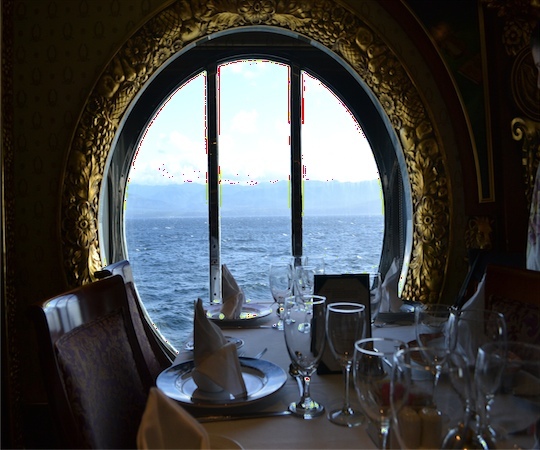 Very hard to see – I was unable to get a photo later as the windows were covered in too much water. Taken from the cruise ship. Most of the buildings shown are cruise-ship bait – trinkets, shirts, and jewelry for the tourists. I did eat a quick lunch at the Pirate Saloon and listened to a cowboy named Sitka Tex sing and play guitar. The evening we were to dock in Victoria, the captain got on the intercom and informed us that high winds made this port too dangerous to attempt a stop, so we parked it for a few hours, then headed down toward Seattle, arriving the next morning (Tues, Sept 11), and debarking. 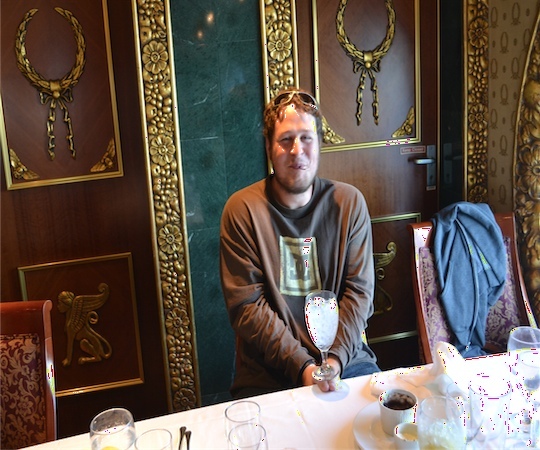 On the Carnival Spirit, we were fortunate to have a table next to a window. This guy didn’t share his ice cream with me so the waiter ‘ice cream water boarded’ him by first placing his thumbs under a glass of ice water (?) and then shoving a spoonful of ice cream in his mouth – he had to hold this pose for about 30 seconds – lesson learned, ice cream hoarder!